I love treats. Love ’em. I have a Pinterest board with 154 mouth-watering treats pinned on it, and I want to eat all of them. Like Apple-Spice Layer Cake with Caramel Swirl Icing. Or a Giant Oatmeal Creme Pie. Or Chocolate and Coconut Cream Pie Bars. And maybe one day I’ll make them (I mean – did you look at them? YUM.) 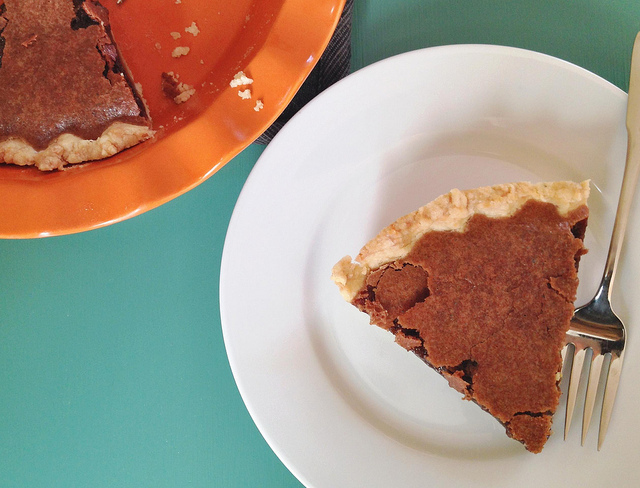 But here’s the thing…in about 45 minutes, with ingredients I always have in my pantry and fridge, I can make and be eating one of my very favorite desserts – chocolate chess pie. Chocolate chess pie is dense, dark, chocolatey heaven with a crackly, brownie-ish top, and when it’s served warm with a scoop of vanilla ice cream, it’s everything I want a treat to be. My college roommate Rachel (creator of extremely cute and quirky clothes and accessories for kids at Bullpin Apparel) introduced me to this pie. It’s one item on a long list of things she’s taught me (see also: befriending people with jigsaw puzzles and CatchPhrase tournaments, the names of all the NFL franchises, asking insightful/hard questions in a way that makes people want to answer, and how to Chi my hair). By some miracle we’ve ended up living close enough to each other to have regular time together! Today I took pictures while she whipped up the pie, and none of our combined four children even had time to feel neglected. The crust is flour, sugar, and salt, mixed with a splash of milk and some oil. I love that it doesn’t need to be chilled or rolled out – just pat it into the pan! There. That took 5 minutes. Now for the filling! Melt a stick of butter and 2 squares of semisweet Baker’s chocolate. Meanwhile, mix the eggs, vanilla, and sugar. Mix them together and pour into the unbaked pie shell! Exactly 35 minutes later, this baby is sitting on the stovetop. Hello, lovely. See how the very top of the pie is shatteringly crisp and the middle is kind of like underdone brownies? It tastes even better than it looks! Every time I make this, someone asks for the recipe! One friend who made it later confessed that she and her husband finished the entire thing in less than 24 hours. 😉 Go and do likewise! Stir together flour, salt, and sugar. Add milk and oil and stir. Press into a 9-inch pie plate. Add filling and bake as directed. Melt butter and chocolate together (I use the microwave for this). In a separate bowl, whisk together eggs, sugar, and vanilla. Pour butter/chocolate mixture into sugar mixture SLOWLY while stirring (so the eggs don’t scramble from the warm butter). Pour into the unbaked pie crust and bake exactly 35 minutes. Serve warm with a scoop of vanilla ice cream! I love this pie crust for its simplicity and shortbread-cookie-ish texture. My sister uses melted coconut oil in the crust – I haven’t tried it yet but she said it gives a subtle coconut flavor which sounds delicious to me! You can also use a regular rolled crust or a storebought crust. No joke, I just opened up the computer to look up this recipe to make dessert for tonight, got distracted by fb–and found the recipe anyway! ;o) Thanks! Hahahaha! Yesssss. I’m in your head. Or you’re in mine. Or something. Oh. My. Goodness. Will be making this soon…. Tempted to do it right now but I am laying on the couch exhausted. I will go and do likewise this week!!! Unless you wanna come here and whip one up for me:). Miss you!!!! I’ll totally make you one. ;o) Christmas??? Yes Christmas! But one just went in the oven… Can’t wait! I just made this tonight with gluten-free flour, using the coconut oil as your sister suggested. It was amazing. Maybe even better than the gluten-filled version. So there’s an option for the gluten-free eaters.